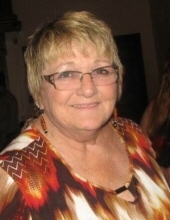 Jeanette Ruth Betzing Taylor of Mell Community of Green County, Kentucky, daughter of the late Pete Betzing and Jean Dorrance Betzing, was born on Wednesday, November 26, 1947 in Trenton, Michigan and departed this life on Friday, November 30, 2018 at her home. She was 71 years, and 4 days of age. She had made a profession of faith in Christ and was a member of the Greasy Creek Baptist Church. She was also retired from General Motors. Survivors include four sons and three daughters-in-law: Daniel and Diane Taylor of Greensburg, Jim and Laura Taylor, Clyde Taylor, and Lary and Laini Taylor all of the Mell Community; two brothers: Pete Betzing of Utah, Earl Betzing of Michigan; special family member: Jenny Haggadone; 15 grandchildren; 8 great-grandchildren; and a host of other relatives and friends. Jeanette was also preceded in death by a sister: Pamela Winzel. The funeral services for Jeanette R. Taylor will be conducted at 12:00 Noon, Central Time, Monday, December 3, 2018 at the Cowherd and Parrott Funeral Home with burial to follow in the Parnell Cemetery in Adair County. Bro. Wilburn Bonta officiating. Memorials are suggested to Hosparus of Green River, which can be made at the funeral home. To plant a tree in memory of Jeanette R Taylor, please visit our Tribute Store. "Email Address" would like to share the life celebration of Jeanette R Taylor. Click on the "link" to go to share a favorite memory or leave a condolence message for the family.